Yeah, it's photoshopped. I've seen Tom Cruise in person and he doesn't have that line down his face in real life. Nope, not photoshopped. His teeth are INDEED a bit off center. I noticed it as a little girl when I was obsessed with Legend. Why do I have two front teeth? I want one like him! Not shooped. 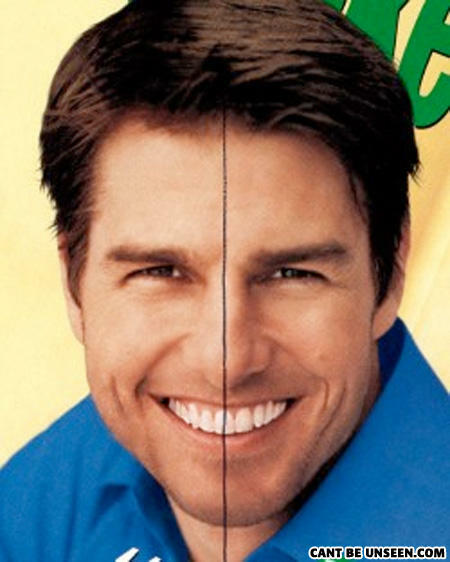 Tom Cruise has three frontal teeth. It's not very abnormal, actually. I am missing the same tooth he is. It's not as noticeable though. Rly? I saw Tom Cruise in person and he totally had a line down his face. I've actually also got only 3 front teeth. its because his teeth are fake, at least the front ones are, he knocked them out on purpose because he thought it would fit his role in "the outsiders"
Holy crap that is terrifying! I wonder if the real TC has three front teeth too. Its not photoshopped. google tom cruise smile and you'll see that his teeth are weird. Its not photoshop... On the left side of his face u can even see a pimple/birthmark or whatever it is lol... So people who say it is photoshop, just shutup cause ur... Wait whats the word...? Oh yeh WRONG!! @Nope, not photoshopped. His teeth are INDEED a bit off center. - "Yes, you can see his incisors (sharp teeth) are 3 teeth apart, not the normal 2." Apparently he's since had them corrected, that's why people don't believe it. Trust me, that was his hideous mug before hand. my teeth do this, my left front tooth is in the center of my head. Look at his teeth real close. WHAT THE HELL? Just look up tom cruise images and watch your dreams turn to dust. It's looks fake because of all the other photos. it might be photoshopped, might not. it might look like he has the tooth in the middle because of the way they took the picture, but hey, whatever sinks your boat. He is not missing a tooth, nor does he have one extra. All his upper teeth are shifted to one side. So that ugly line explains why he always looks to the side on movie posters! OMG WOAH You draw a straight line on a face!!! u must be a photoshop pro!!!!! LOOK! his teeth are off to the side! clearly tom cruise is an alien! no wonder he's a scientologist!